Please click here to watch the full video "Develop in Harmony." 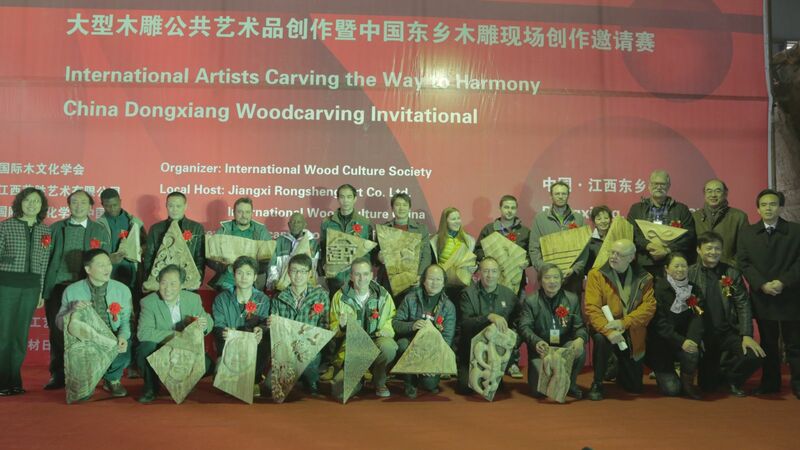 Artists holding their works pose on stage to commence the International Collaborative Woodcarving Sculpture Project on March 8, 2014. 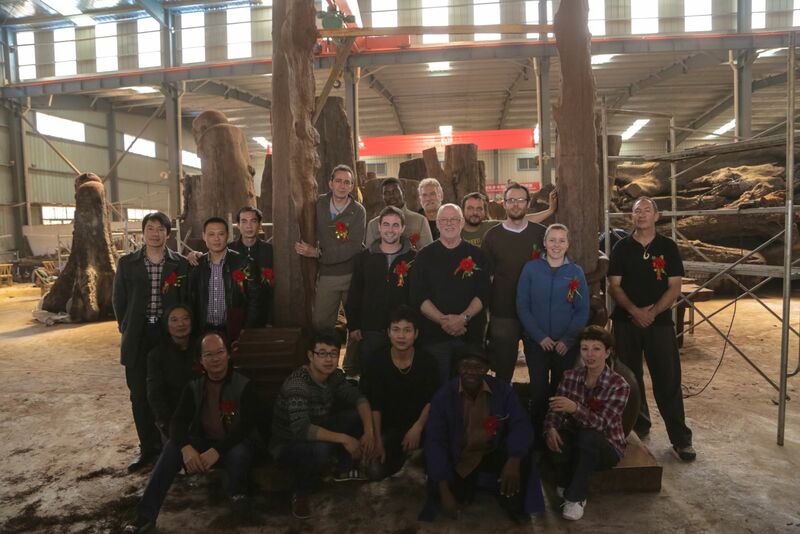 IWCS brought together twenty-one compelling international wood artists to collaborate on a project with the theme “Harmony” prior to the 2014 World Wood Day. 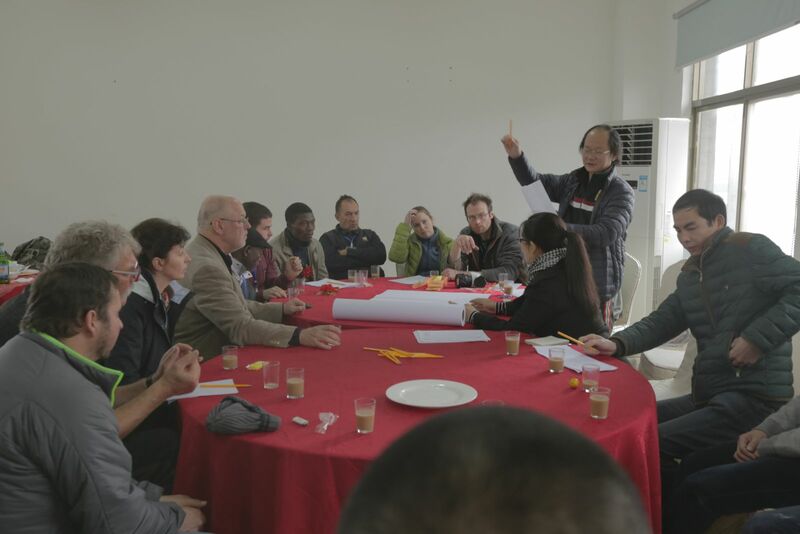 The project took place in Rongsheng Art Village in Dongxiang County of Jiangxi Province, China from March 6 to 18. Attendees fill the Art Village hall for the opening ceremony. 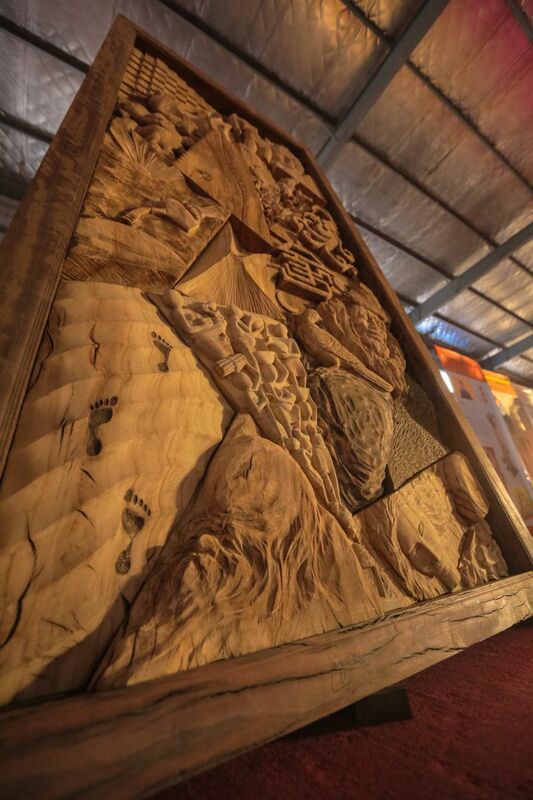 The international woodcarving collaboration is to convey the concept of harmony between man and nature through a sculpture. The project aligned eleven international artists from nine countries with ten Chinese artists, which in itself is a wonderful expression of harmony. 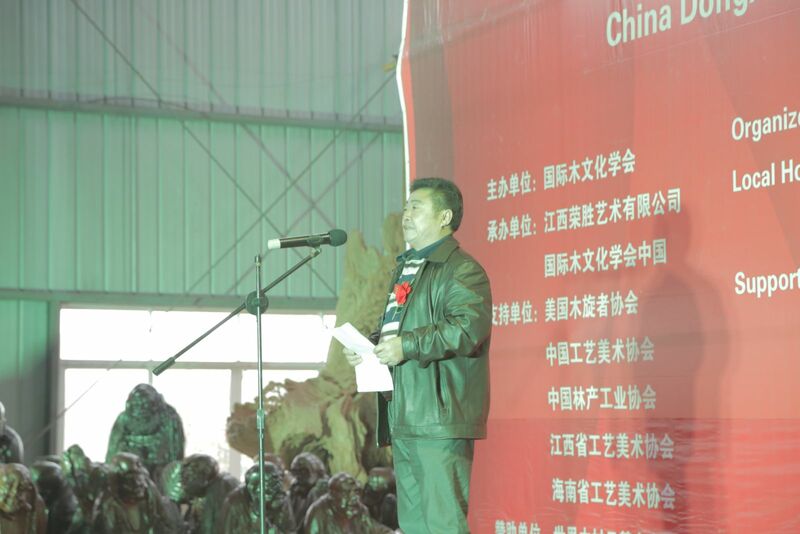 The opening ceremony starts with a speech by Mr. Rongseng Yu, president of Rongsheng Art Company. 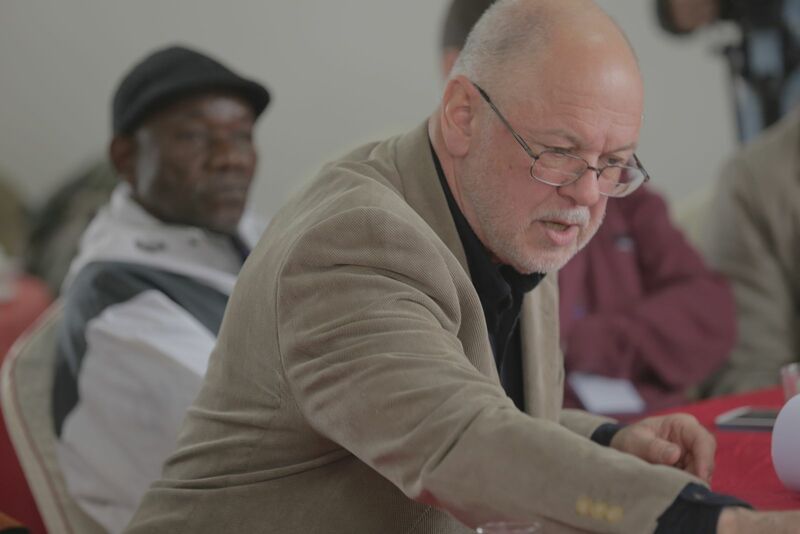 IWCS invited Terry Martin, chair of Turners Without Borders of American Association of Woodturners to lead this collaboration as project manager. 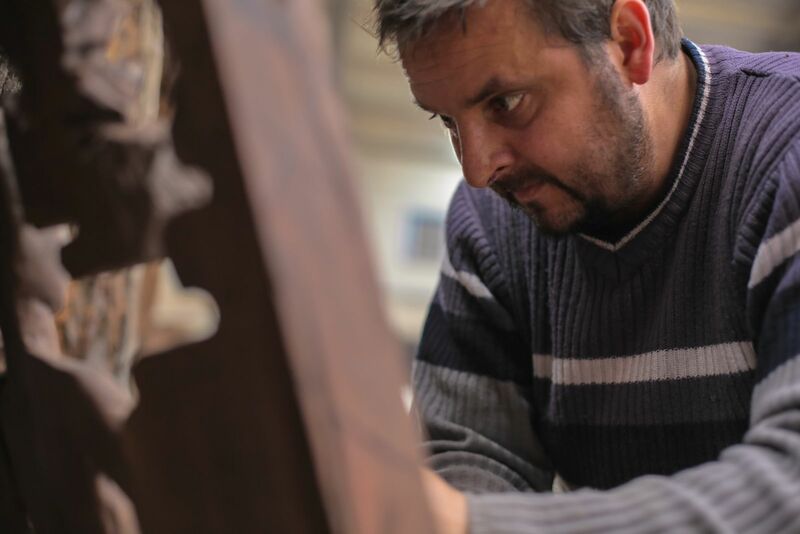 He was the artistic director of the Irish Stone Wall Project last year. 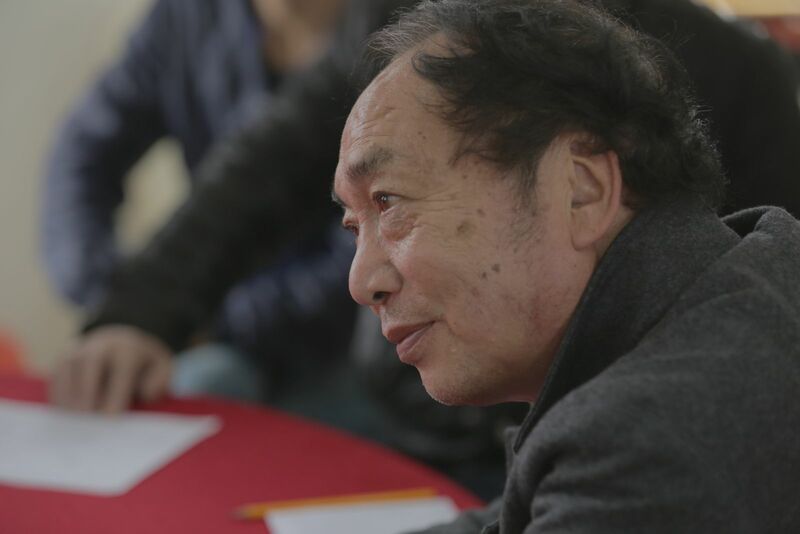 Two leading Chinese carving artists, Gongbo Gao and Wentu Feng, also joined the group as artistic directors. To break the ice, Lyonel Grant of New Zealand (center) suggests that all the artists start with a warm-up group sculpture of 18 pieces to show their mastery. All the artists show their expertise to contribute to the first collaboration. 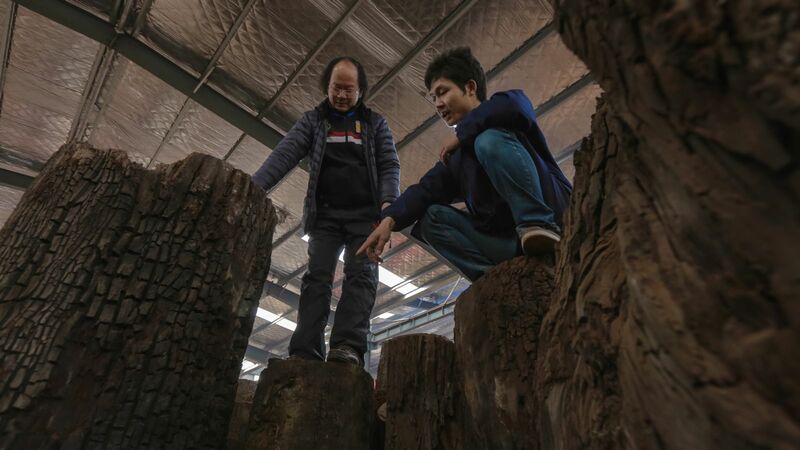 Pictured are Australian artist John Van Der Kolk (left) and Chinese artist Xinhua Ma (right) working on their piece respectively. 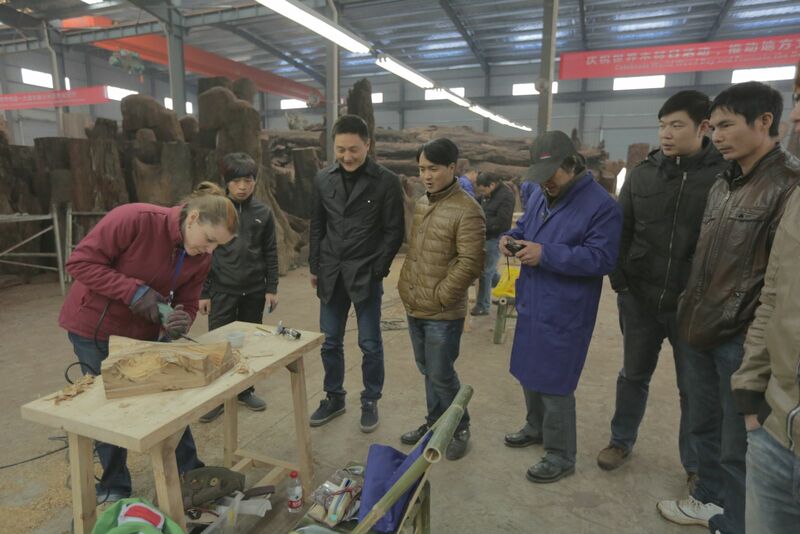 Chinese artists and craftsmen of the factory watch the British artist Louise Hibbert (left) carving at the workshop. 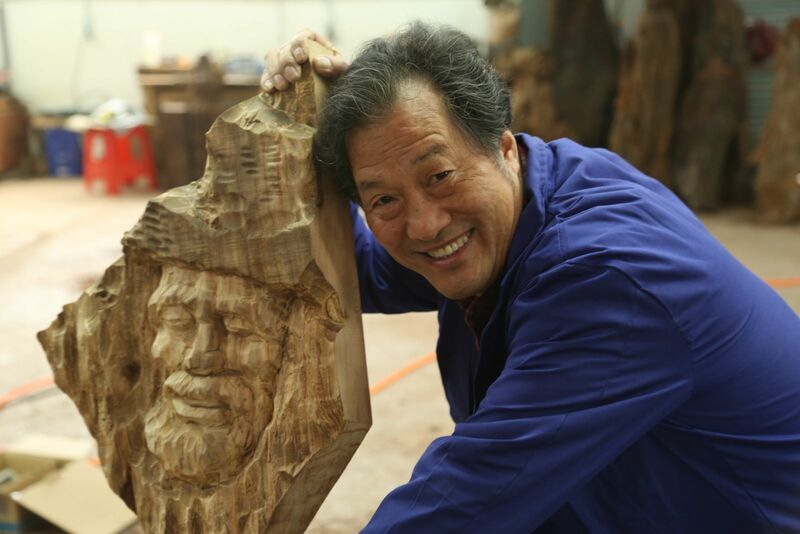 The artistic director Mr. Gongbo Gao poses with his woodcarving piece. The ice-break group work tells the background and skill of each participant. To kick off the improvisation project, firstly, they discussed the ways and means of carrying out the mission. Taking the communication difficulties into consideration, the participants decided to divide the group into two teams, international and Chinese. Terry Martin, project manager (left), leads the group discussion and Wentu Feng, artistic director (right), brings insightful advice to the meeting. Chinese artist Xinhua Ma proposed an idea of “the gate of arts” to symbolize a doorway for the harmonious interplay of various cultures. Surprisingly, British artist Louise Hibbert came up with the archway idea at the same time. More innovative and intensive discussions have been generated since. 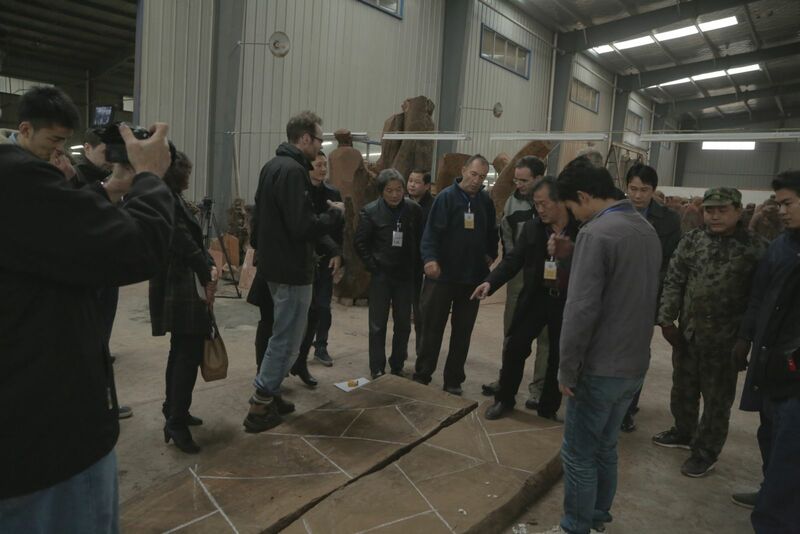 The Chinese artists explain their original concept to the international artists. Later on, all the artists reached an agreement on two sculptures in the forms of an arch and a gate. Each team would accordingly build their designed structure, switch the built structures with each other, and design and elaborate the switched structure at their discretion. Each team makes a scale model of their designed structure. The actual size of the arch is approximately 3 meters in height and 5 meters in width, and that of the gate is approximately 4 meters in height and 3 meters in width. 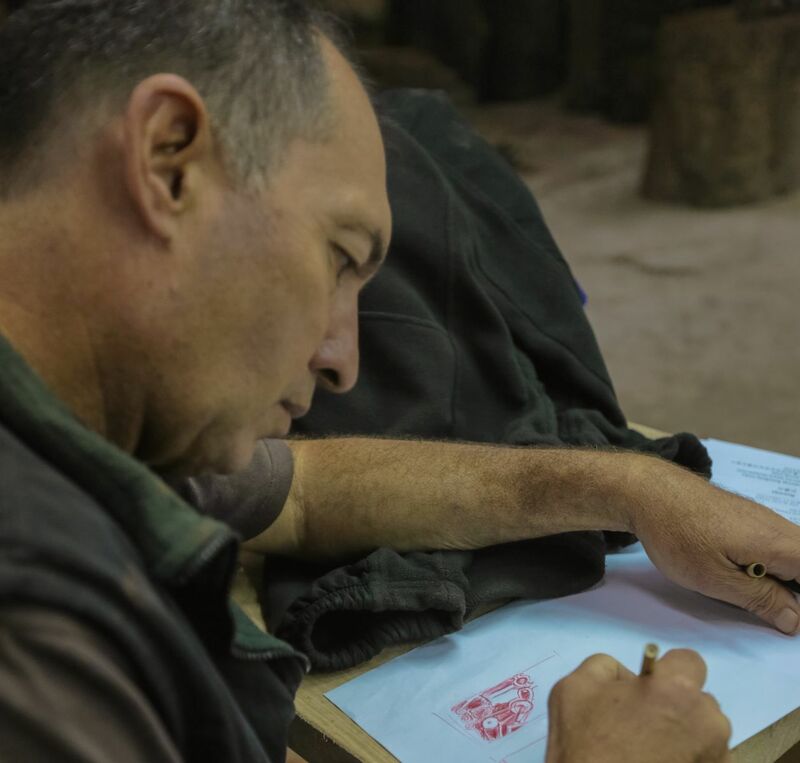 The artists spent plenty of time to work out the best way to collaborate with artists of varied cultural backgrounds. Moreover, it took longer for the international artists to adjust to the new working environment in a foreign land. Thus, the time frame left for the project was very limited by the time they started to build their structure. 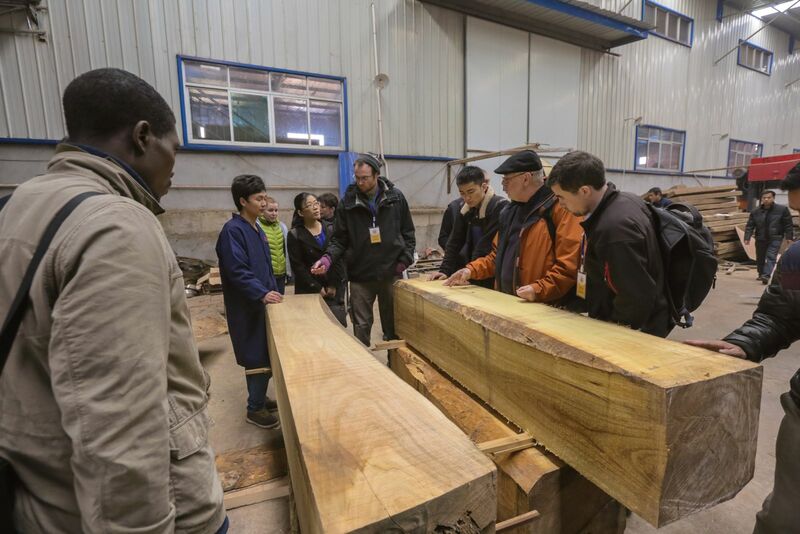 The international team selects camphor logs to construct an arch. 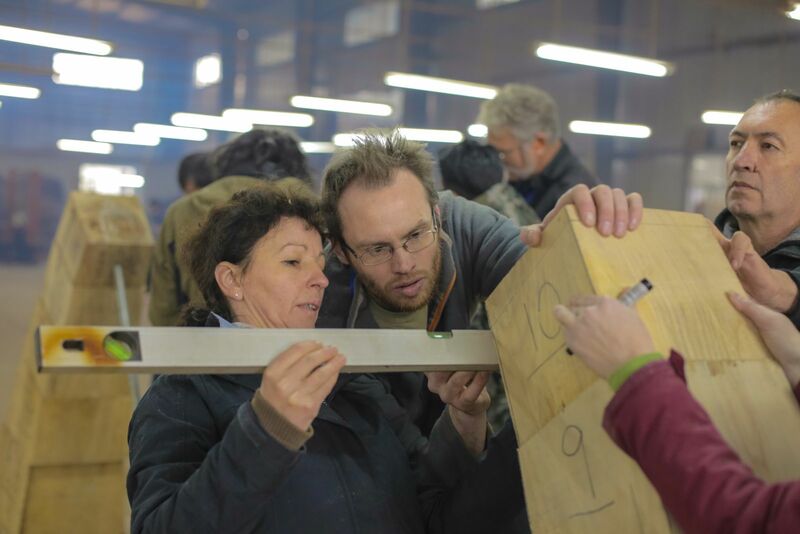 Romanian artist Manesa Burloiu Zina (left) and Irish artist Cillian O’Suilleabhain (right) try to figure out the best way to join the blocks to make an arch. 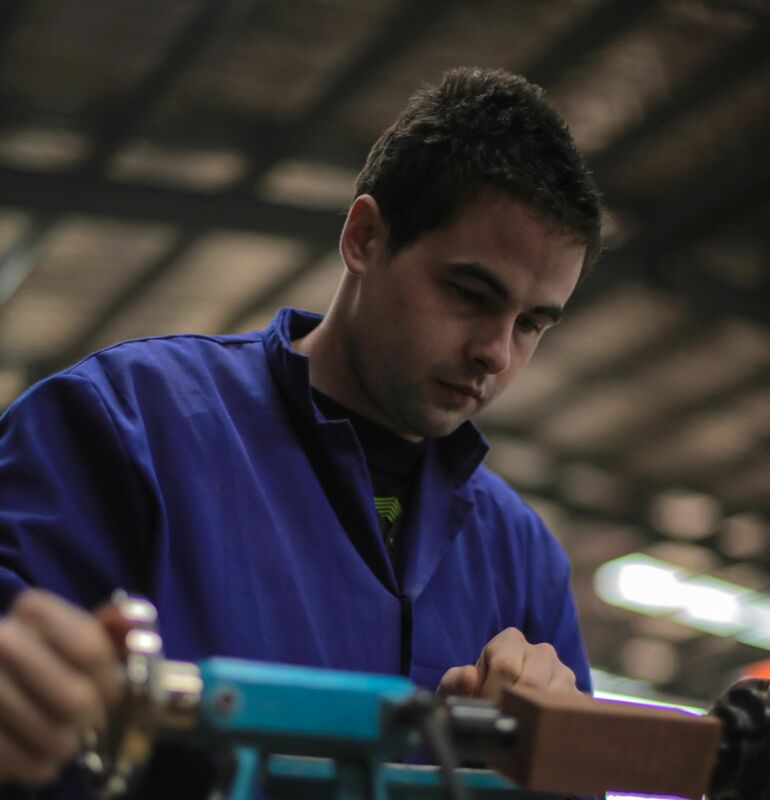 Irish woodturner Adam Doran, the youngest member in the group, turns objects to support joining of the blocks. 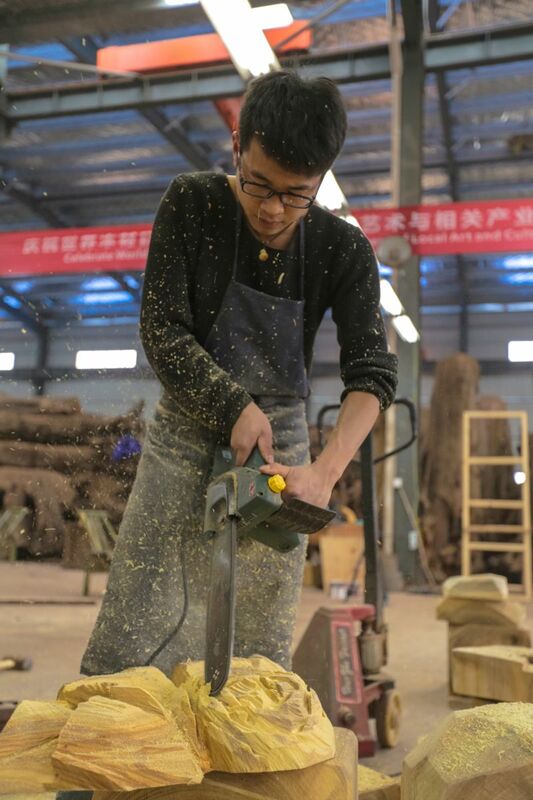 A Chinese woodworker makes mortise-and-tenon joints, the ancient Chinese technique for frame construction of wood, to combine the blocks on the base of the arch. 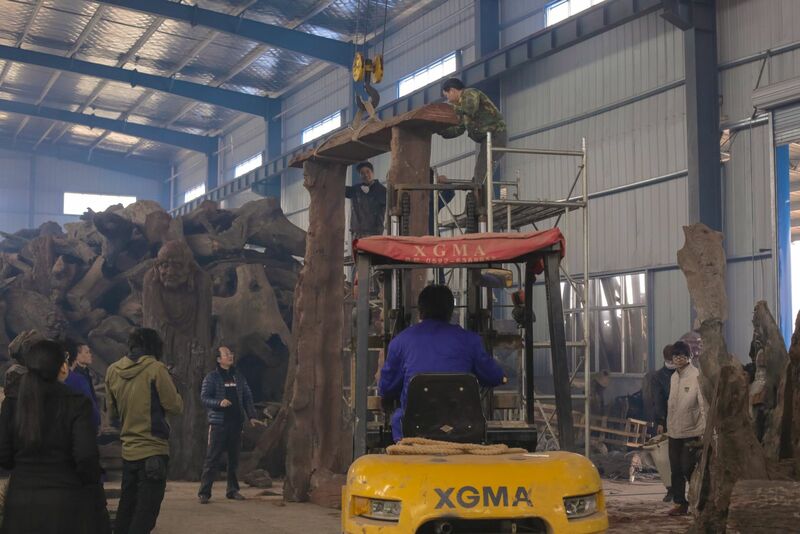 The international artists assemble the arch with the assistance of the Chinese woodworkers who play an important part in the project. 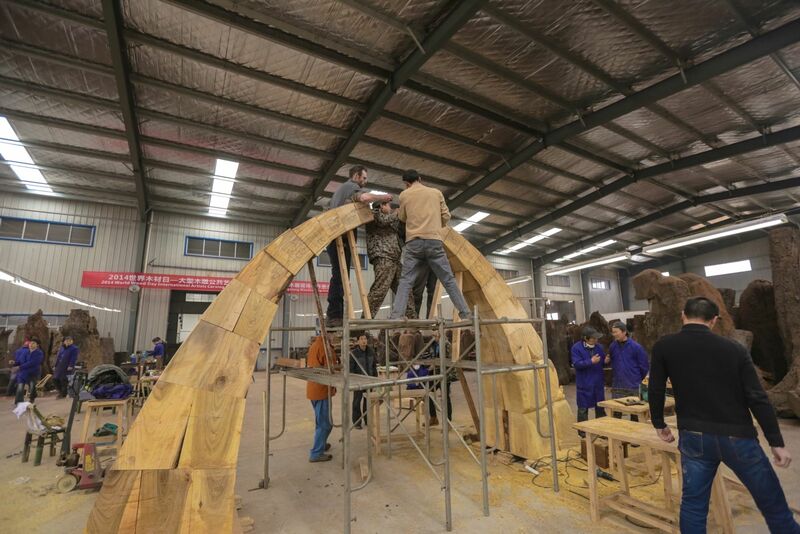 The Chinese team saw the arch itself as a bridge of transformation from the Stone Age to the Industrial Era. The idea matched up nicely with the original intention of the international team who designed the arch. Thus, some artists fixed up the surface of the structure to embody the transforming process; others adorned the arch with carved rocks, flowers and birds that implied a sense of primitive living and being. 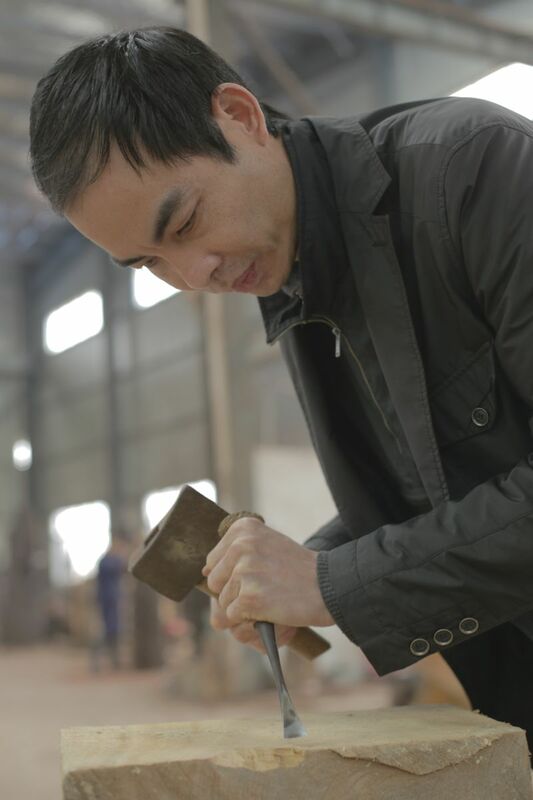 The Chinese team makes rocks with remnants of wood left from the structure of the arch. 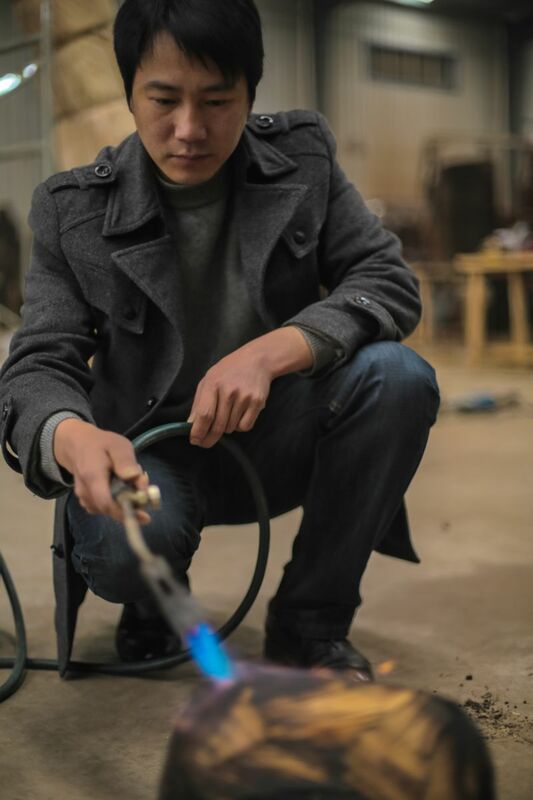 Chinese artist Jianjun Gan (left) finishes a wooden rock with burning technique; Haibo Wang (right) carves a flower sculpture. 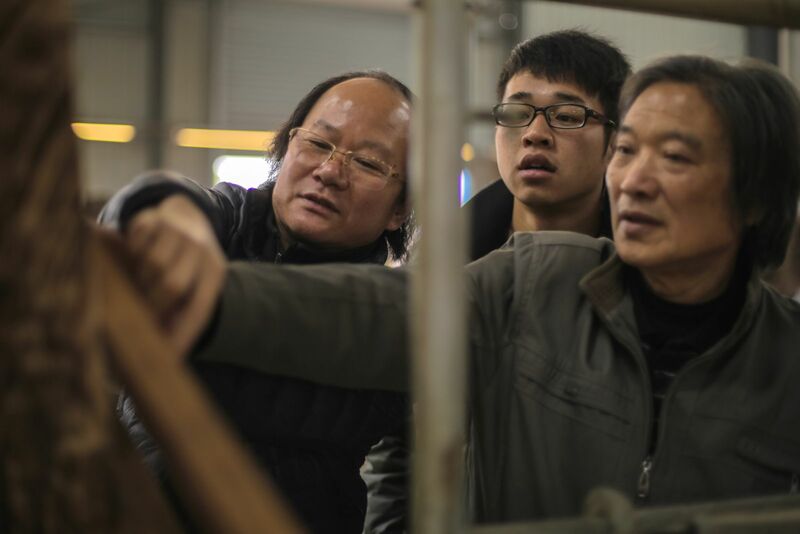 Members of the Chinese team, including Guanfu Mao (right), make individual and collective efforts to modify the arch. There were undoubtedly some anxious moments during the undertaking, particularly when the deadline was impending. 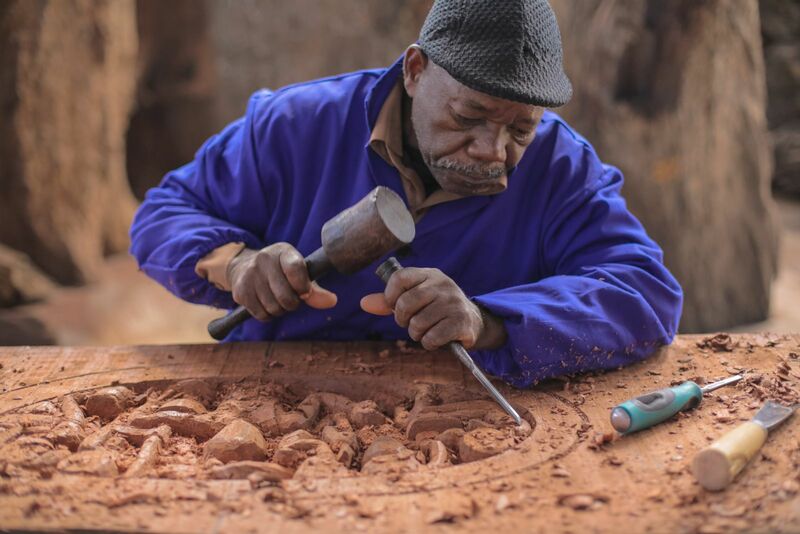 However, the artists took on the real challenge with perseverance, mutual trust and professionalism. 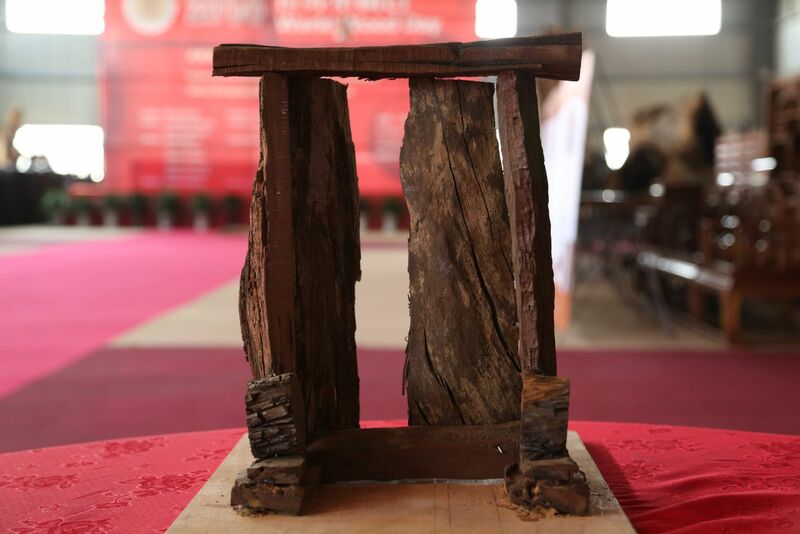 As a result, of their efforts to transcend cultural and language barriers as well as technical difficulties, both sculptures illustrated a clear breakthrough in artistry and techniques beyond their usual approaches. Chinese artists Songyun Xiang (left) and Dong Guo (2nd from right) shape and ornament the arch with carvings. 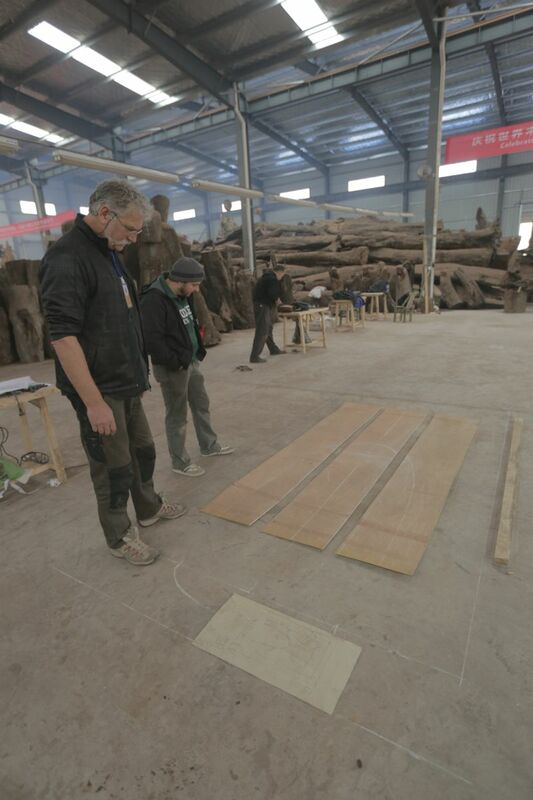 The Chinese team selects ancient wood to build a gate. Photographed are Guohua Wang (left) and Juping Lu (right). 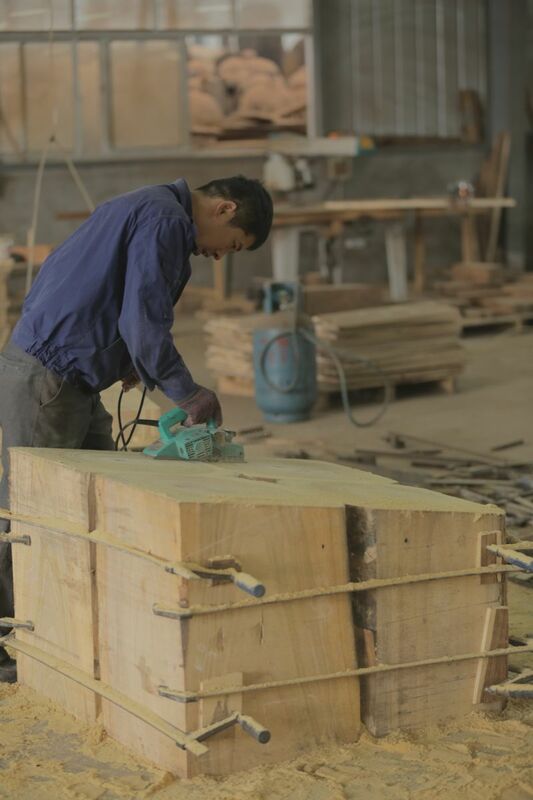 The Chinese team tries to fix the crossbeam to the gateposts with mortises and tenons to make the structure sound and solid. The frame of the gate is constructed when it lies flat. 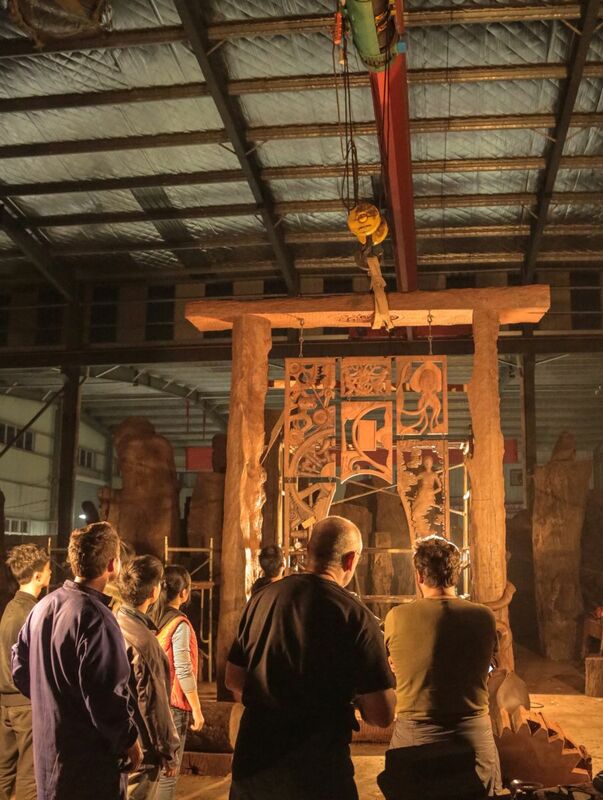 The Chinese artists and woodworkers join hands to erect the gate. After the structures were built and switched, the international team attempted to tap into the transition from nature to a man-made modern world through the Chinese gate. They added panels and objects to the gate and virtually left the structure intact except the crossbeam. Each worked on an individual piece to interpret the stages of the transition that was symbolically originated from a sprouting seed. Artists look at the templates of panels designed to be hung on the gate. 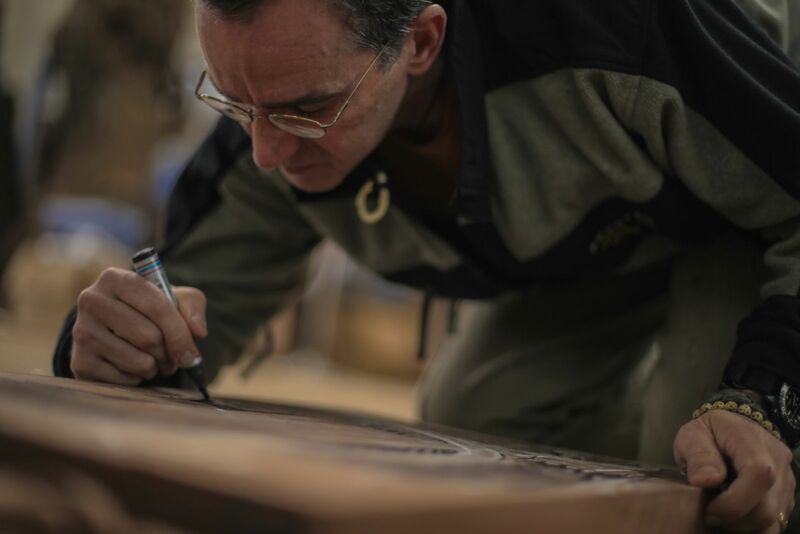 Tanzanian artist Yohana Martin Liteka (left) engraves the crossbeam, while Italian artist Demetz Lorenz(right) works on a panel. Lyonel Grant (left) and American artist Jacques Vesery (right) work on their own panels. 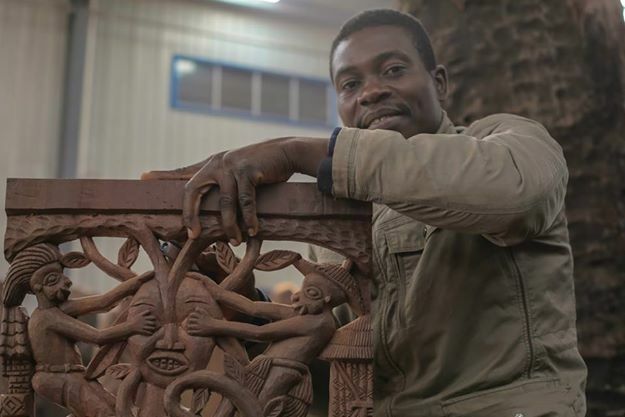 Cameroonian artist Emmanuel Vuchi poses with his individual artwork. The installation of the gate was breathtaking. It was rich with allusions to the progression from nature to the mechanical and filled with ingredients of classic and contemporary savors within the works. The international artists work in the evening to fix the hanging problem (left). 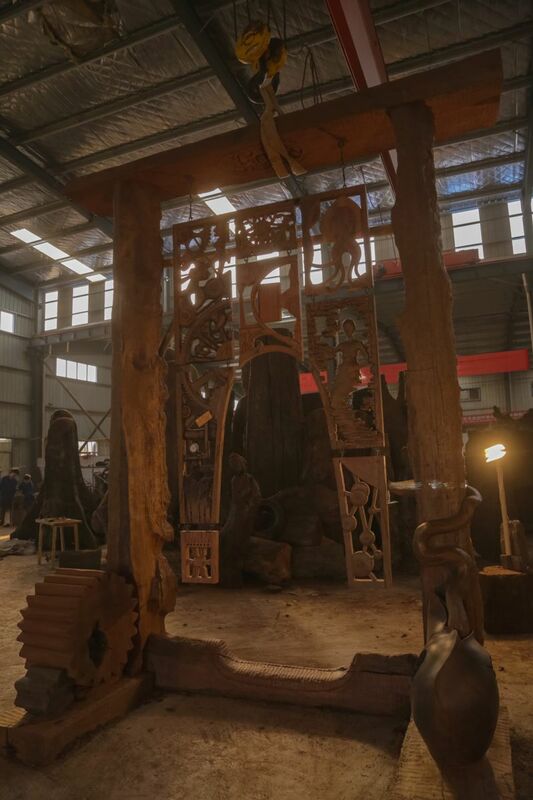 They demonstrate the beauty of woodcarving through the gate (right). 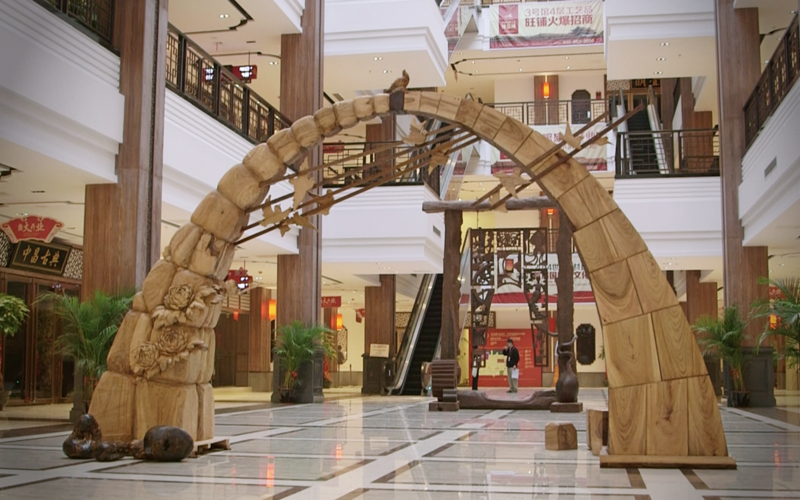 The finished gateway and archway are put on display as the International Collaborative Woodcarving Sculpture Exhibition at the WWD celebration in Xianyou. 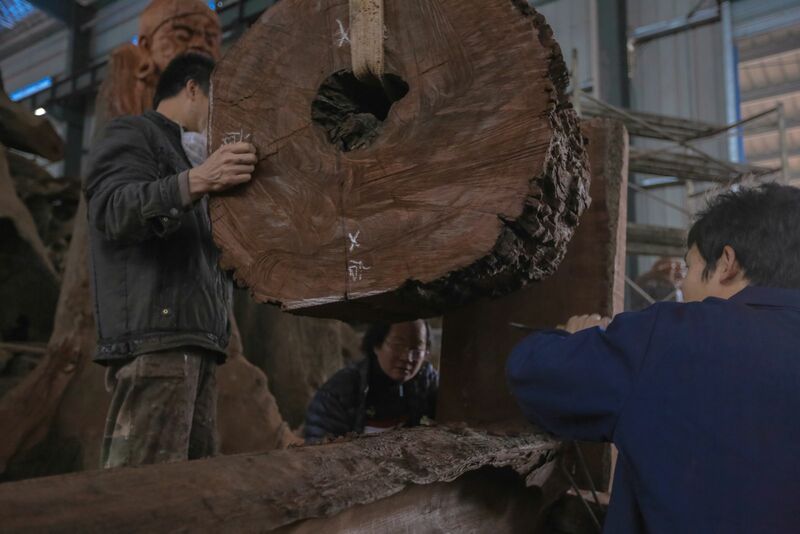 The synergy of the multi-national group contributed to the accomplishment of the harmony project that connected and resonated with wood, cultures and people. Throughout, all participants gained fresh perspectives that they wouldn’t have been exposed to otherwise. 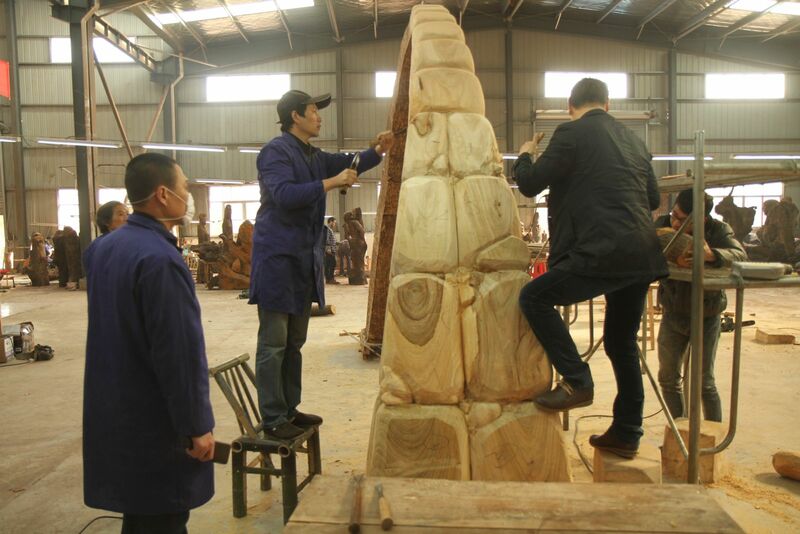 New perspectives and friendship develop in a harmonious manner through woodcarving. “It’s a wonderful adventure.” said Terry Martin. 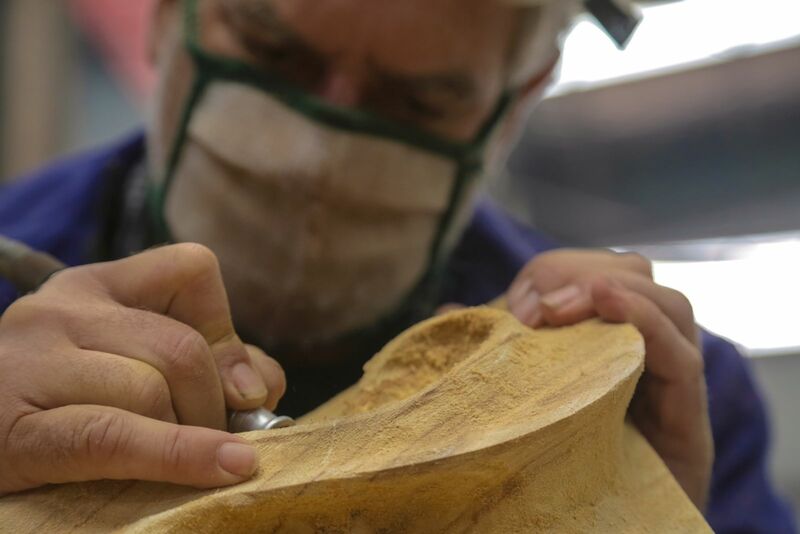 The two teams have joined forces to challenge their typical thinking and carving with a success. 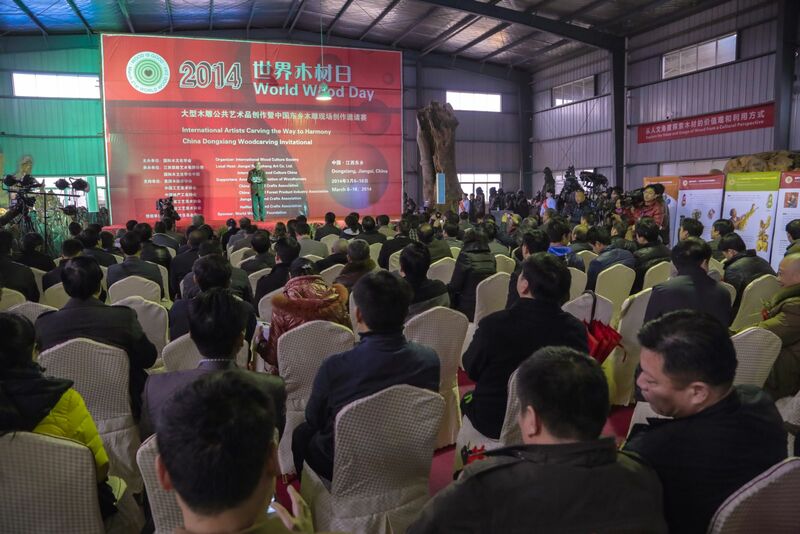 The fruitful outcome, not only marked the advancement of international woodcarving collaboration, but also served as an overture to the inauguration of 2014 World Wood Day.